while putting fans of other professional sports down. Yes, you’re passionate about your sport. Yes, lots of kiddos each year play it as a form of competition. Yes, certain parts of the country sell out big stadiums to watch the most popular teams. 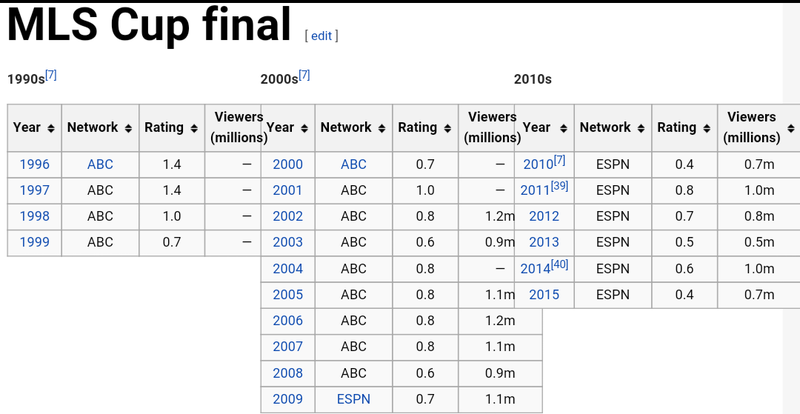 But hate to break it to you….your tv ratings for the sport are awful. I bring this topic up because in the sports fan world their needs to be a reality check on propaganda by soccer fans and the truth. Many times I hear the line of “It’s the fastest growing sport in America”. Maybe being played but not people gathering around televisions to watch it. This number has been, and will continue to be, misrepresented in the media as a grand sign that women’s soccer, and soccer in general, is a big-time sport in the country. If it does better than America’s past time, how can it not? But here are a few other numbers for you: 30.4 million, 24.4 million, 31.1 million, 21.4 million. Those are the average viewership numbers for the last four Olympics (2008 Beijing, 2010 Vancouver, 2012 London, 2014 Sochi), the latter two of which featured every major primetime telecast showing recorded sports. And those aren’t one two-hour program on a holiday weekend with a captive audience, like Sunday night’s win. That’s the average of 15 days of coverage lasting approximately 3 hours and 30 minutes each. There’s no comparison. After MLS scored an excellent August with TV ratings far exceeding the norm, MLS viewing audiences this past weekend took a big hit. Out of the two nationally games on English-language TV, the average viewing audience was 77,000 (63,000 for the Toronto-New England game on ESPN2, and 91,000 for Orlando-Sporting Kansas City on FOX Sports 1). Both MLS games had a ratings share of 0.0. The poor ratings are a worrying sign for Major League Soccer and the broadcasters (FOX, ESPN, Univision) who have invested millions in MLS/US Soccer for 2015-2022. Well, duh! MLS blows. What you fail to realize my boy is that they are talking about USMNT – US Men’s National Team. Like the currently playing Copa America. 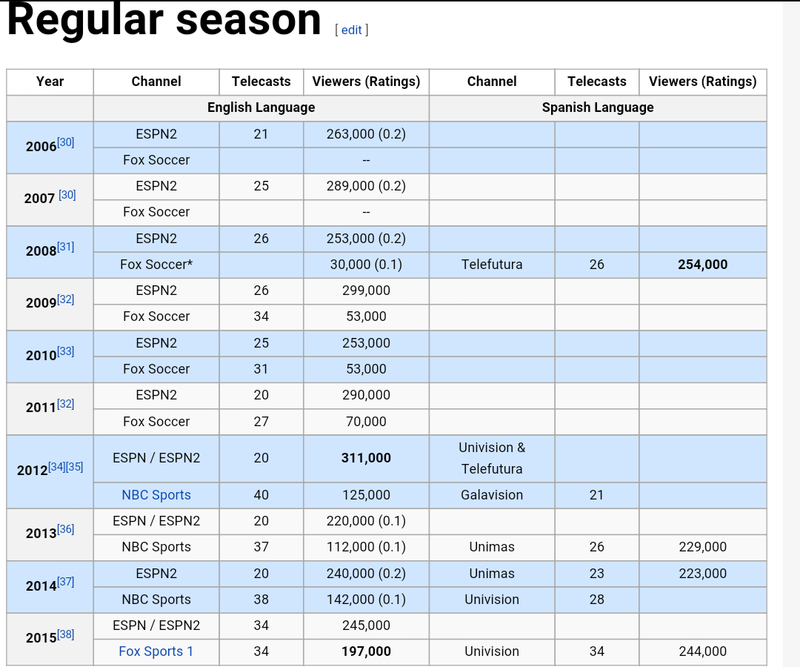 Compare those numbers to the 4th largest US sport, hockey, then tell me how unpopular soccer is. Congratulations, you’re on par with hockey……..